Before I give my full review of Sheena Cundy’s The Madness and The Magic, I must take time to marvel at its cover. On first glance, it looks as if it’s a reimagining of the Hanged Man Tarot card with a pale woman on the front instead. Her long red hair nearly touches the grass from her hanging pose while her green and black tights makes it seem as if she’s wearing a child’s Witch Halloween costume. In the corners of the cover, there are many other items heaped up like small trinkets: a cat, a guitar, boots, a cross and bible, and a spider. There’s a lot going on, and at first, I thought the cover was a bit too crowded, a bit too overwhelming, and like a bit of a mess. But isn’t that what everyone says when they first see a spread in a divination session and they have no idea what the future holds? Because yes, I should not have judged a book by its crowded cover. The Madness and The Magic delights in that madness while also providing the reader a way to decipher every last meaning. The table of contents contains all the chapter titles and each one seems to name, and then signify, an object on the cover, thereby making it into a narrative symbol. Each item on the cover has a purpose, and indeed, the cover acts as a skeleton key to figure out the main mythos of the story. The Madness and The Magic is a cozy book; it’s one that you read with a mug of tea between breaks at your job, or that you curl up with at night after the work day is done. At its core is a dual romance; the first focuses on Ronnie and her interest in a friend, while Ronnie’s Wiccan mother Minerva attempts to court the new vicar in the neighbourhood. Both romances end happily — and I have to admit, I utterly adored Minerva’s story. Cundy has written a feel good book, and it’s a feel good book with Wiccan protagonists. Basically, it’s the type of witch-lit I crave, and it gave me exactly what I wanted in that regard: twists and turns, delightful flirting, and a baby narrative that was as challenging as it was rewarding. When I finished the book, I was ready to discard it and start the next adventure. But then I caught sight of the cover again. And I fell in love with the story all over again. Each item illustrated has a purpose, but it doesn’t manage to spoil the story. There are no baby clothes or even a horse (which, as you will find out when you read, is a major turning point in the novel). Instead the cover manages to project the overall feeling behind the story, caught and contained in a new interpretation of the Hanged Man Tarot card. Instead of the man, we get Minerva, who attempts to do some yoga in her backyard and goes into a backward headstand, only to feel caught as she freaks out over seeing a spider. In order to get herself out of this mess, however, she can’t rely on her daughter like she’s done in the past, but must instead stay calm until she effectively rights the world again. When she does manage to restore order and return to her feet, she’s presented with a mess of trinkets and symbols, the madness which she must then interpret — and of course, make magic from. And in order to do so, her daughter must also accept the mess of her life, and work through the symbols rather than casting them aside. This is the actual triumph in the story. Though largely structured around the romance plot, this is a novel about mother and daughter and overcoming internal biases, prejudices, and looking at one thing and believing it to be another. The Hanged Man is a card of sacrifice and seeing the world from a new perspective and it’s a lesson that affects every single character in the story in some way or another. The Hanged Man becomes the key to figuring out the mythos story, which may seem odd. It’s not The Lovers card or even The Sun for this romance story, but a Tarot card that deliberately twists people out of focus and makes them view things from another (sometimes quite painful) perspective. Once you untwist yourself from the Hanged Man’s pose, the world is never the same again — but the world can still be good. And honestly, that’s the kind of happy ending I want at the end of the day. Screw riding off into the sunset like every other romance novel. I’ll take my leading ladies prevailing and persevering. 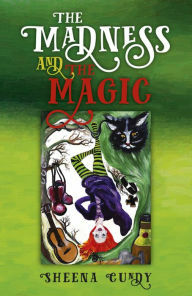 The Madness and The Magic is a fun, easy read that I would recommend to anyone who wants yet another witch-lit read. There are some tiny quibbles I have about the book — mostly to do with the twist near the end and how there are some factual errors in what occurs — but to prevent spoiling it, I won’t rehash too many of those details. Symbolically, the book works and works well — as I soon found out, once I had shifted my own perspective.